Some additional data may be available from the USGS database National Water Information System (NWIS). 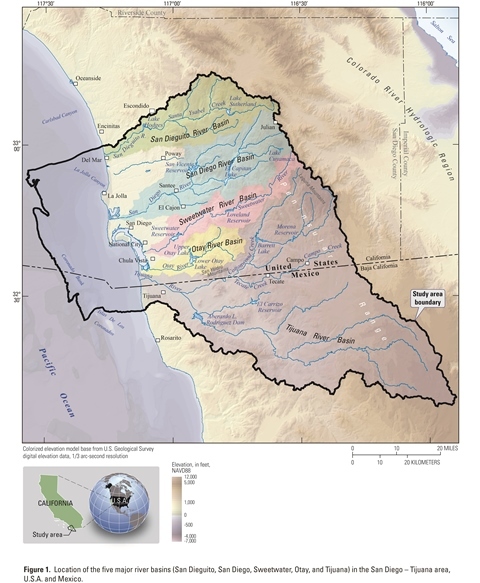 The first comprehensive geologic and hydrologic study for the San Diego area, California. This study will provide the integrated hydrogeologic knowledge necessary in this important and highly visible area of the United States and will serve as a role model for similar coastal settings throughout the world that have modest rainfall and small aquifers. Locally, results will help state and federal agencies, water purveyors, and consultants to understand the local surface-water, groundwater, and biologic resources and how these resources interact with each other, and to critique ideas and opportunities for additional groundwater development. Develop an integrated, comprehensive understanding of the geology and hydrology of the San Diego area, focusing on the San Diego Formation and the overlying alluvial deposits. Use this understanding to evaluate expanded use of the alluvial deposits and the San Diego Formation for recharge and extraction. Map of completed and planned multiple-depth well sites in the San Diego Hydrogeology project. Click on image to download map in PDF format. Part or all of this page is linked to a Portable Document Format (PDF); the latest version of Adobe Reader or similar software is required to view it. Download the latest version of Adobe Reader, free of charge.